Narcotics detectives arrest three individuals responsible for illegal drug sales to kids. 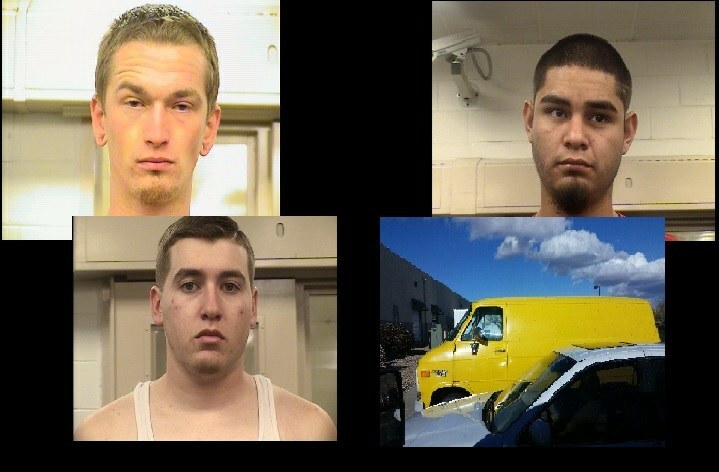 Jonathan Midyette, 25, Luis Perez-Beltran, 22, and Michael Guthrie,22, were all arrested following a drug investigation. Detectives received information a subject was selling narcotics to students near Cibola High School, some sales resulting in overdoses. The detectives quickly responded to this information by putting together an operation to catch those who were responsible. Detectives were told the suspect later identified as Jonathan Midyette, was selling Marijuana out of his yellow Chevy van at or near the skate park by the high school. Through their investigation detectives were able to identify his supplier as Luis Perez-Beltran during a buy operation who was found to be selling Marijuana and Cocaine. Midyette was later arrested on February 9th, at the Eagle Ranch Apartments after detectives were able to secure an arrest warrant. Perez-Beltran and Michael Guthrie were arrested the next day at the skate park near the school during another buy operation with detectives. Midyette and Perez-Beltran were arrested and charged with felony narcotic related charges to include Conspiracy, Possession of Narcotics with the Intent to Distribute and Tampering with Evidence. Guthrie was arrested for violating his probation. The overdose victims have recovered and are expected to be okay. Narcotics and Northwest Impact Detectives did an outstanding job on this investigation. However their work is not done. Since these arrests were made, these suspects have been released from MDC and are back out on the streets. Officers and Detectives are working hard to keep people from trying to harm our children and will continue to make arrests and conduct these operations to remove these offenders off the streets.